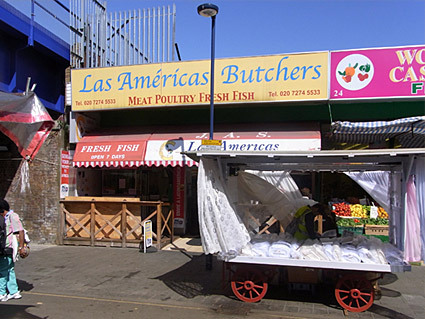 c1900 A carriage bearing the name of G.J.Guyer, purveyor of 'High class Provisions' of 403-05 Brixton Road, stands outside N.W.Hubbard's coal merchant (est. 1869) in Popes Road. 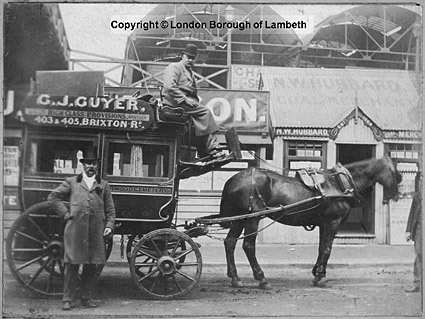 The coach advertises a service between Brixton and Norwood Cemetery. Towering above Hubbard's corrugated shack can be seen the coal staithes. These brought coal to the row of coal merchants populating Pope's Road by means of an elevated set of two railway sidings. The wagons dropped their coal into storage spaces below. I managed to see one photo from track level and the whole thing was made from wood, and was looking very tatty by the mid 1950s. I'm guessing that it was taken down by the early 1960s at the latest - if anyone has any photos, I'd love to see them! 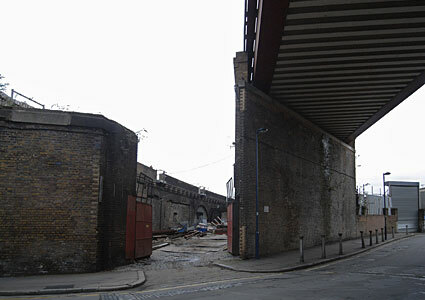 July 2009 The coal depot and merchants on Pope's Road have long since been swept away, and the elevated railway dismantled. A Kwik Save store stood on the site in the 90s, but it's now occupied by a series of small shops. Detail from 1894 Ordnance Survey map showing location of coal depot. Click for larger image. Here you can see the area (on Valentia Place, looking east) where the railway sidings would have fanned out from the railway line on the left to reach Pope's Road staithes (behind the camera). Feb 2008 Looking west towards Popes Road from Valentia Place. 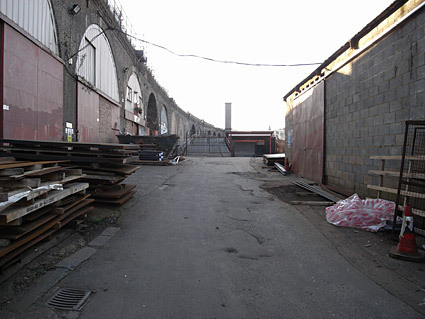 The sidings would have been directly above to the right.